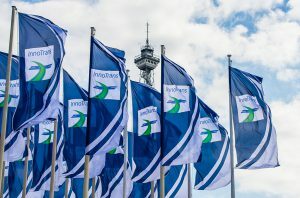 The biggest and most important trade fair in rail business – Berlin’s InnoTrans – will open its gates in less than two weeks. BORCAD cannot miss this opportunity and invites you to visit our booth no. 320 in hall 1.1. What are this year’s highlights? In premiere, we will introduce our two new products – VISIO seat for regional transport and FLEXIO seat for long-distance transport, focusing particularly on high-speed trains. For the first time will also be presented our new tip-up seat. Displayed will be our best-selling GENIO seats as well as COMOFORT seats – including a customized, luxurious 1st class seat on a rotating base. A distinctive feature of our booth will be a full-scale mock-up of seating in new interior of Swiss Glacier Express trains, containing our COMFORT seats tailor-made according to wishes of our customers – Matterhorn Gotthard Bahn and Rhätische Bahn. We are looking forward to meeting you in Berlin! Previous Post A NEW WEBSITE IS BORN!